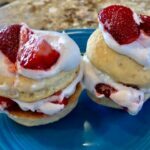 These ingredients are healthy and delicious! #LunchBreakLIVE with The Veggielitas : Suzanna Urszuly and Maria Robson! These two women have launched Mahina Beautè, an extraordinary, vegan, cruelty-free, nontoxic beauty line! 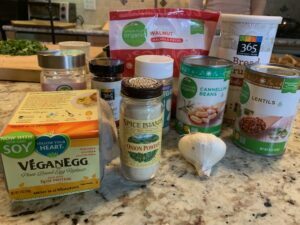 Today, they are making vegan meatballs from scratch! Baking them makes them even more helpful! Maria starts making the marinara sauce by sautéing olive oil and onions. Suzanna explains when you add salt it speeds up the cooking process. Then the Veggielitas add the tomato sauce and basil. Let it simmer and there you go, marinara sauce! Then the ladies start working on the vegan meatballs. 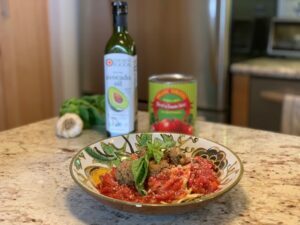 They mix together beans, mushrooms, and walnuts for protein-packed vegan meatballs. If you prefer, you can use quinoa instead of pasta to avoid carbohydrates. 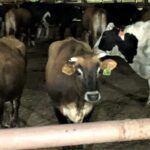 These ladies love animals of all kinds, so they have dedicated their company to helping animals. They also collaborate with a charity organization called Start Rescue, which focuses on spaying, neutering, and transporting animals in need. They also have an amazing nontoxic cruelty-free PETA-approved skincare line called Mahina Beautè. Jane has been using this skincare line personally, and thinks it is doing wonders for her skin. 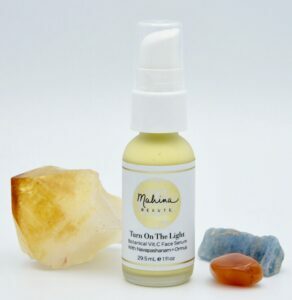 She recommends the “Turn On The Light Serum,” which is citrus infused so it rejuvenates your skin! 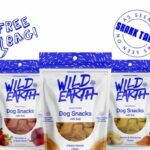 This skincare line is a must try and they donate a portion of their profits to JaneUnchained News Network and The Start Rescue. 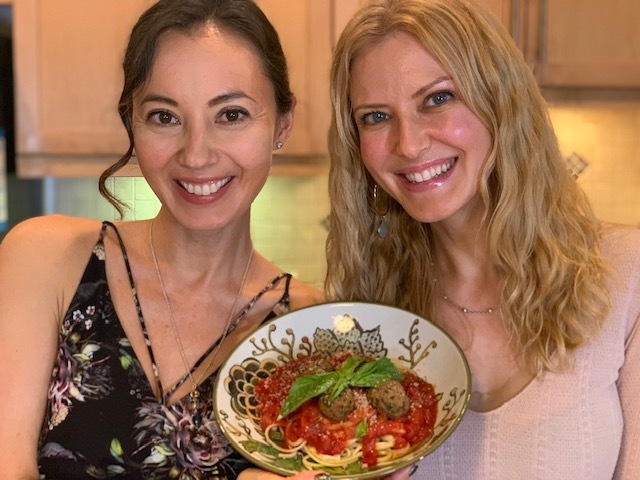 Feel good and look good with the Veggielita’s recipe for homemade vegan meatballs below and their amazing Mahina Beautè skincare line! These beautiful ladies are not just good looks, they are smart entrepreneurs and amazing vegan cooks! Visit MahinaBeaute.com to get your cruelty and chemical-free products! Don’t forget to type in the discount code “JANE” at the check out! Visit the Start Rescue website! Jane Velez-Mitchell reporting for JaneUnchained News Network. Photos courtesy of Jane Velez-Mitchell. 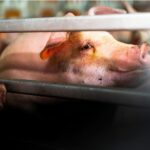 Compassionate vegan fashion models. They radiate beauty! Stay moisturized with their Rejuvenating body oil. 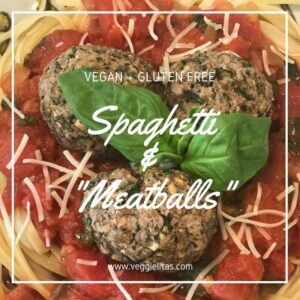 These meatballs are vegan gluten-free goodness! 1. Pre-heat oven to 350F. 2. Toast bread. Once toasted, place in food processor and set aside. 3. In a heat resistant bowl, add dried shiitake mushrooms in it. Pour some filtered boiling water over the mushrooms. Add enough water to fully soak the mushrooms. Leave until soft. Reserve 1 cup of water and set aside. Drain shiitake mushrooms and set aside. 4. Combine the lentils, navy beans, mushrooms, walnuts, garlic, salt, onion powder, parmesan, basil and parsley in a food processor. Pulse until all ingredients are finely chopped. 5. Add bean mixture into a big mixing bowl. Stir in the bread crumbs into the bean mixture. Add the egg replacer and sparkle the gluten-free flour. 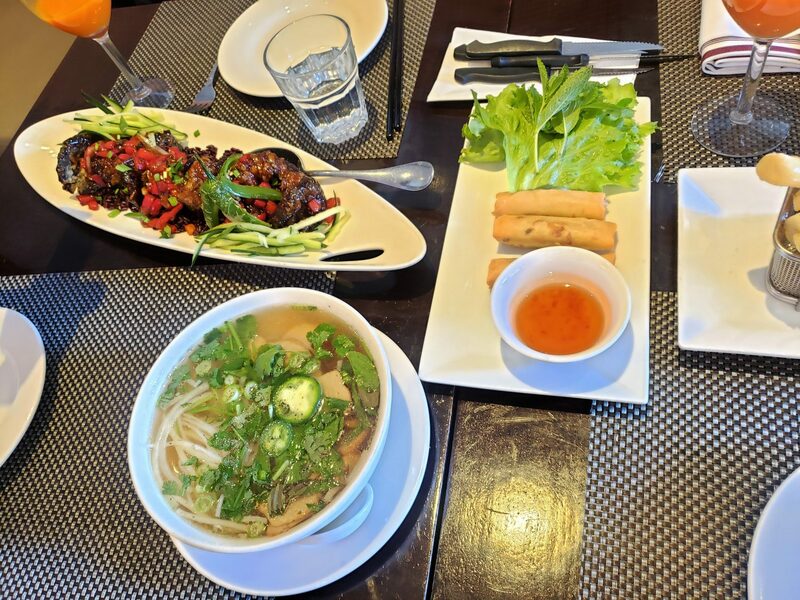 Using your hands, make sure that all ingredients are combined. 6. Scoop 2 Tablespoon of bean mixture and form a ball shape. Place on a parchment paper. 7. 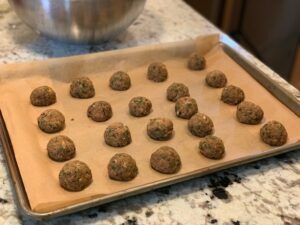 Coat “meatballs” with olive oil. 8. Bake for 40 min, until set and golden. 1. Heat olive oil in large saucepan over medium heat. Add garlic till fragrant. Add the onions and salt. Stir for a few minutes until onions are translucent. 2. Add canned tomatoes, red pepper flakes, and basil. 3. Bring to a boil, then cover with a lid, reduce heat to low. Let summer for about 20-30 minutes. Cook pasta accordingly to package instructions. 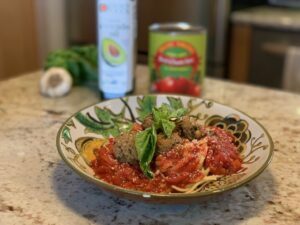 Combine the pasta with sauce and top off with a few “meatballs” on top. Garnish with vegan parmesan cheese. PreviousPizza Plant has a Vegan Pizza Truck! 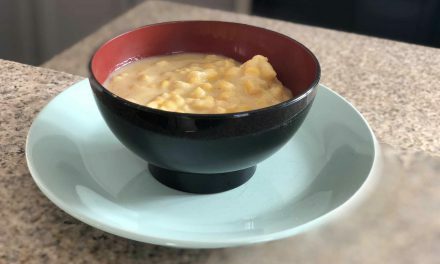 Creamy Corn Casserole, Vegan Style! 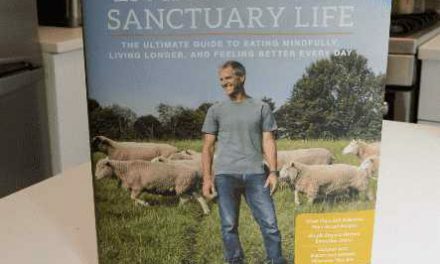 Learn How to Live a Farm Sanctuary Life: Mindful, Compassionate, Healthful. What Could be Better? 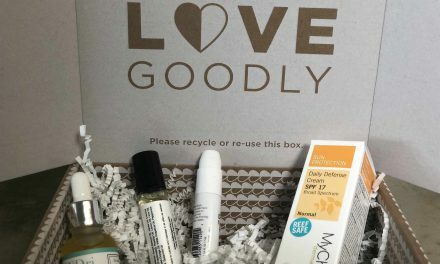 LOVE GOODLY: Beauty Minus the Cruelty!